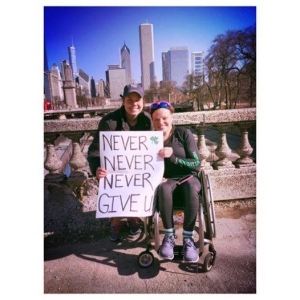 The Claddagh Foundation was formed after Mary Kate Callahan became paralyzed overnight at 5 months of age as the result of a condition called transverse myelitis. Since her injury in 1995 many suppporters have helped us advance spinal cord injury research and assist individuals and families living with a physical disability. As a result of this support we have been able to help many organizations and individuals through research funding, equipment grants and adaptive recreational and sports programs. We are always interested in learning about local organizations doing great things in this area so please help keep us informed. Your support greatly improves the day to day lives of those living with a disability. Thank you! All tickets being purchased at the door will be cash only! ☺ thank you for your support! The Claddagh Foundation is recognized by the Internal Revenue Service as a 501(c)(3) organization. Donations are tax deductible to the extent allowed by law.